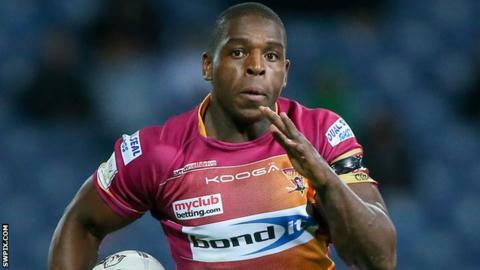 Huddersfield Giants winger Jermaine McGillvary has said the club's failure to win a major trophy is "getting boring". Last season, the Giants lost to Leeds in the sixth round of the Challenge Cup and were beaten by Wigan Warriors in the play-offs. "It is getting frustrating for the players and fans, but it is up to us to fix," he told BBC Radio Leeds. "I think it needs addressing because it is not good enough." He added: "It's not any individual, it's down to us as a team because we crumble at vital stages. You can't keep going on like that. "You look back in history and you're just known as chokers which is not a good tag." Huddersfield won the League Leaders' Shield in 2013 but have never won a Grand Final and last won a Challenge Cup final in 1953. McGillvary was the top try-scorer in Super League in 2015 with 27 and helped England to a series win over New Zealand in November. He says he is not setting himself any personal targets for the forthcoming season. "I don't know how I achieved what I did last season because I didn't set any goals. I think it will be more of the same this year, I won't put any more pressure on myself," he said. "It's hard not to feel confident and well within myself but I think that's a good thing."